In keeping with dessert-themed entries this week, this evening’s post will be a review of one my favorite chocolate bars — Lulu’s Chocolate. This post has actually been a longtime coming, as I’ve been meaning to praise the wholesome rich goodness of these chocolate bars for some time now. I first discovered Lulu’s chocolate back in April (in the pre-blog days), on the shelves of a health food store in San Francisco. How do I remember the date you ask? More to come on that later…(although does one ever really forget LAFT– love at first taste?). The organic and fair trade ingredients consists of: cacao, coconut palm sugar, vanilla bean, sea salt & LOVE. Upon sampling the bar, I could indeed attest that the handcrafted chocolate has some kind of magical, “love” component. It was truly one of the most palatable pieces of chocolate my taste buds have ever met. No doubt this has to do with the bar’s high-quality ingredients, such as the pure vanilla bean (no extract), coconut sugar (a nutrient-rich natural sweetener derived from the sap of palm trees), and of course raw cacao. 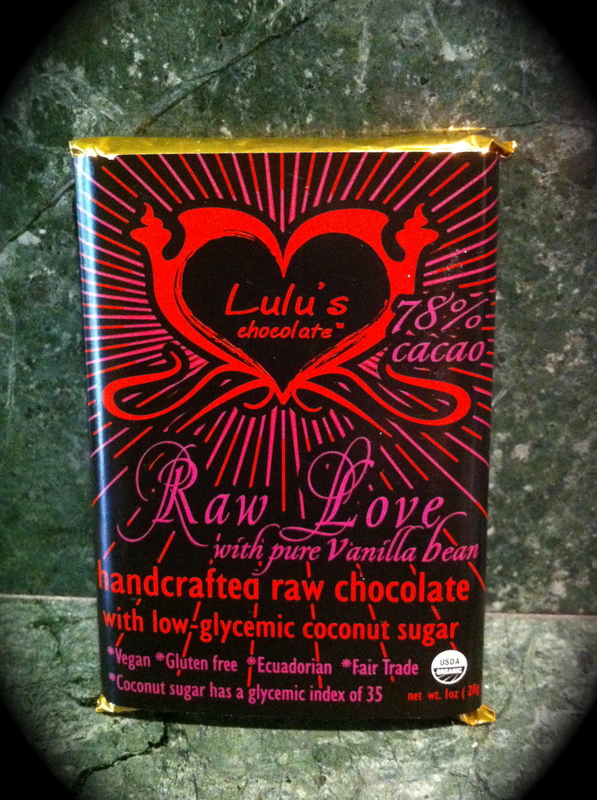 Lulu’s chocolate originated out of a visit to Hawaii, where Lulu — creator and practitioner of raw chocolate alchemy — was inspired by the taste of raw cacao and moved to share her passion with others. After a period of experimentation and a successful Burning Man camp, her business was borne. 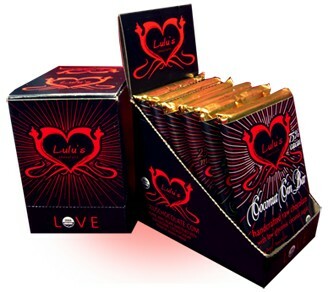 Lulu’s chocolate comes in 6 different flavors– Raw Love, Sedona Spice, Maca Love, Chocolate Maca Chunk, Aztec Crunch and Smoked Sea Salt Almond. Although I have tried nearly all the flavors by now, “Raw Love” remains my favorite (I am a loyalist at heart). I should also mention that for dark chocolate, the caloric content is remarkably low, with only 116 calories and 8g of fat in the 28oz bar. So how did I remember the date of my introduction to the raw chocolate? Well, I didn’t…until I revisited my electronic receipt that is. The only fault I could find with Lulu’s bars initially were their lack of supply in stores. Thus, I promptly went online and ordered a package of these elusive bars to be delivered chez moi. Naturally it would’ve been spring…a time for raw lovers.